In the past year, Microsoft’s stock has gone up more than 40%. In the past two years, it’s nearly doubled. All of this came after something around a decade of that price not really doing anything as Microsoft initially missed major trends like the shift to mobile and the cloud. But since then, new CEO Satya Nadella has turned that around and increased the company’s focused on both, and Azure is now one of the company’s biggest highlights. 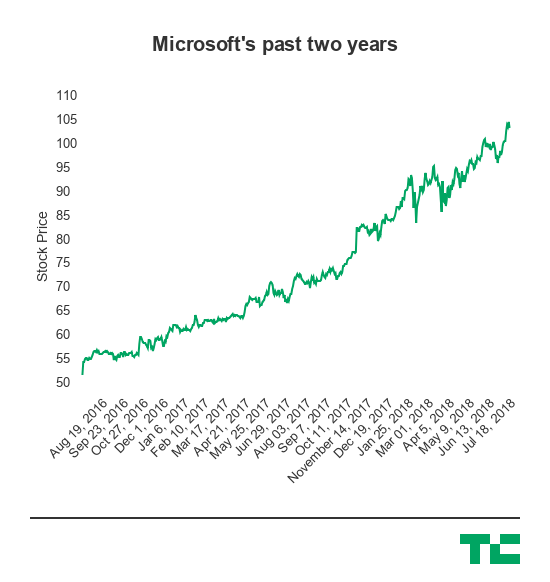 Microsoft is now an $800 billion company, which while still considerably behind Apple, Amazon and Google, is a considerable high considering the past decade. In addition, Microsoft passed $100 billion in revenue for a fiscal year for the first time. So, as you might expect, the stock didn’t really do anything. For a company that’s at around $800 billion, that it’s not doing anything poor at this point is likely a good thing. That Microsoft is even in the discussion of being one of the companies chasing a $1 trillion market cap is likely something we wouldn’t have been talking about just three or four years ago. The company said it generated $30.1 billion in revenue, up 17% year-over-year, and adjusted earnings of $1.13 per share. Analysts were looking for earnings of $1.08 per share on revenue of $29.23 billion. LinkedIn: Microsoft said revenue for LinkedIn increased 37%, with LinkedIn sessions growth of 41%. Microsoft’s professional network was also listed in a bucket of other segments that it attributed to an increased operating expenditures, which also included cloud engineering, and commercial sales capacity. It was also bucketed into a 12% increase in research and development with cloud engineering, as well as a bump in sales and marketing expenses. This all seems pretty normal for a network Microsoft hopes to continue to grow. Azure: Microsoft’s cloud platform continued to drive its server products and cloud services revenue, which increased 26%. The company said Azure’s revenue was up 89% “due to growth from consumed and SaaS revenue.” Once again, Microsoft didn’t break out specifics on its Azure products, though it seems pretty clear that this is one of their primary growth drivers. Office 365: Office 365 saw commercial revenue growth of 38%, and consumer subscribers increased to 31.4 million. Alongside LinkedIn, Microsoft seems to be assembling a substantial number of subscription SaaS products that offset a shift in its model away from personal computing and into a more cloud-oriented company. GitHub: Nada here in the report. Microsoft earlier this year said it acquired it for a very large sum of money (in stock), but it isn’t talking about it. But bucket it alongside Office 365 and LinkedIn as part of that increasingly large stable of productivity tools for businesses, as Github is one of the most widely-adopted developer tools available. Posted in Software Development and tagged AWS, Azure, Enterprise, google cloud platform, Microsoft.